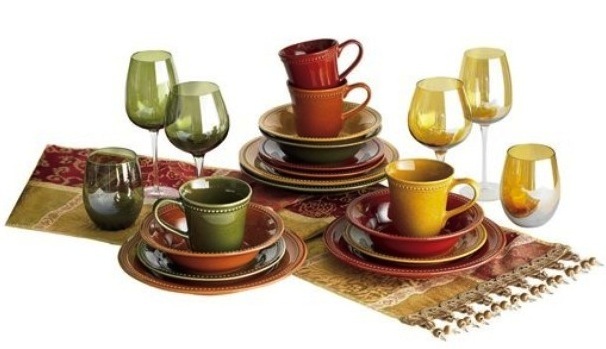 ∼ 2010 ∼ November ∼ 18 ∼ Pier 1 Dinnerware! ” which is currently on sale for $4.00-$4.80, because they are great to mix and match. Bring in a few different colors and it will really feel like fall in your dining room. You can also mix with a few patterned pieces as well. Anything goes, really! Chris and I are lucky to have his Grandma’s gorgeous china, so we won’t be needing any dishes, but, I will be visiting Pier 1 for some decor and possibly to put together a centerpiece. If you have a Pier 1 card, make sure to use it. If you make a purchase (any purchase) with it now through November 24th, you will automatically receive 2000 points which earns you a $20.00 gift certificate! If you don’t have one, open one! It’s quick easy and you, too, will qualify for that $20.00! There are all kind of great benefits to having the Pier 1 card! OMG OBSESSED!